Photo by Sarah Van Liefde. The award-winning New York chef John Fraser has partnered with the museum on a new dining experience. In February, New York’s Metropolitan Museum of Art announced a flashy new partnership with chef John Fraser (of Nix and The Loyal), who is now developing rotating seasonal menus for the on-site restaurant, The Dining Room. The first installation, the winter menu, focuses on mushrooms and features five Fraser-developed courses: Royal Trumpet Mushroom Carpaccio, Chanterelle Polenta, Steamed Bass, Prime Rib, and, to finish, Porcini Pavlova. (No actual porcini mushrooms were involved in the dessert, before you ask.) The menu is available now through April, according to the Met’s team—last Friday, we tasted Fraser's new dishes, and they lived up to his reputation. From being greeted with a "Passion About It" cocktail (bergamot, passion fruit, ginger, bubbles) to dining on decadent polenta and prime rib, each course was thoroughly thought-out and, above all, fun. Each dish was powerfully savory, thanks to the prevailing theme of mushrooms. The chanterelle polenta, in particular, was a stand-out, with the poached hen egg, polenta, chestnuts, and truffles blending into creamy, salty bites. 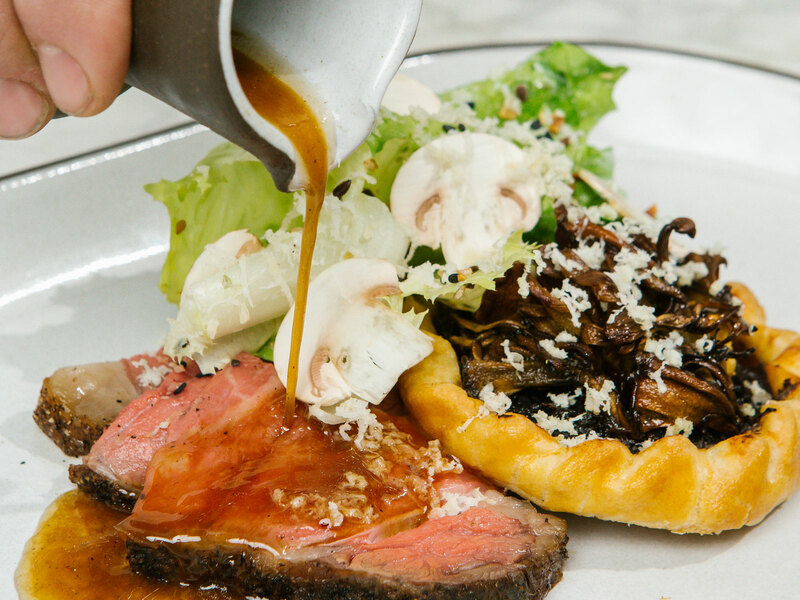 The onion and caramelized maitake mushroom galette, which pairs with the prime rib, was also memorable. The tasting menu experiences pairs a wine with each course, so pace yourself. Course one starts off with a white—Tatomer’s “Meeresboden” Grüner Veltliner 2017, from Santa Barbara, California—and then you gradually veer darker, journeying from white to rosé to Cabernet Sauvignon. The final wine, paired with dessert, is a Madeira by Henriques & Henriques—a very smoky, almost caramel-tasting wine that nicely complements the vanilla cream and chocolate pudding. Certain dishes, like the carpaccio and steamed bass, were very light and delicate—others, like the chanterelle polenta and prime rib, were more hearty (though delicious, nonetheless). It’ll take you a good two hours to make your way through the menu, so make sure you come hungry. Course five, "Porcini Pavlova," looks like a sprouted white mushroom emerging from the earth—but don't be deceived. If you break open said mushroom, you'll find vanilla cream inside, paired with a crunchy, melt-in-your-mouth exterior over chocolate pudding and cocoa crumbs. The Met stays open later on Fridays and Saturdays (9:00 p.m. versus 5:30 p.m.), so if you plan an early dinner, you can wind through your favorite galleries after. Reservations for The Dining Room can be made on OpenTable, or by calling 212-570-3975.